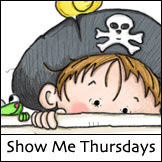 Sassy Cheryl's Digi Stamps Challenge Blog: Challenge 36 - There's Lots Going on Here! Hi, Sassy friends! Thanks so much to all of our participants this past week. You seemed to enjoy thinking outside of the square card for Lily's challenge!! Lots of beautiful entries. And a special thanks goes to our design team hostess, Lily, for putting together two great challenges for us over the last two weeks. And, from all reports, the sassiest of ladies, Cheryl, enjoyed her '29th birthday'.. thanks sassy friends for helping to make it special in every way with all of the good wishes you sent. Well, this is week two of our search for a guest designer. You have until next Monday night, November 8th to enter our challenge and be considered for this spot. (We'll do it from time to time) One lucky person will join us for four weeks of challenges. Each week we pick one random winner and this week, our winner is Edith E.
Congrats, Edith -- just contact Sassy Cheryl via email to arrange for your $5 gift certificate to Cheryl's store. Happy shopping and enjoy your new images. Hi, my name is Jennifer but a lot of people call me Jeni or Jen. If you ask my husband, Steve, he will tell you my name is "card stock". That is his teasing pet name for me at the moment. We live in South Carolina and have two great kids. I am so lucky that they are all supportive of my paper habit which has turned into much more. They are my sounding board and I love to bounce my ideas off of them. I started out scrapbooking but ever since I made my first card I was hooked. I just love to give friends and family something that was made especially for them. I am very honored to be on Sassy Cheryl's design team and I hope you all are pleased with my creations. And we are very happy to have you with us, Sassy Jeni!! Jeni is our hostess this week. Her theme is "Think Fall"... and this is what Jeni and the design team have conjured up as a bit of inspiration. Sassy friends... to play along with us, and to be considered for the guest DT spot, just link up your Sassy Cheryl creation here using Mr. Linky. 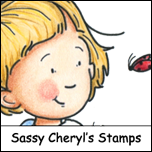 It's very easy.. just make sure you use a SASSY CHERYL image and follow Jeni's Fall theme for this week. We'll be by to see your lovely creations and say hello. Yipeee. More amazing cards! Jeni aka cardstock (funny) . . .welcome! 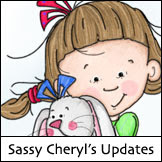 I'm thrilled that you are part of the Sassy Cheryl's DT! Ok everybody. Grab your Sassy Cheryl image and create something 'fallish' and play along! Can't wait to see what you create! Oh and congrats Edith! Forgot to mention that in my previous comment. Congrats Edith on the win. Ladies, you knocked my socks off once again. Fabulous cards. Jeni, great challenge and I'm going to be hurrying to get my entry made. Oh merci ! Je suis contente ! Sorry for my french but i don't speak english very well. I'm very happy to win ! WOWZA....more amazing creations from a fabulously talented team! ik geniet iedere week weer van de prachtige kaarten van het designteam!! geweldig ga zo door! Congrats Edith for being last weeks winner. Great cards design team, I added mine for this week. 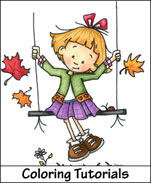 I am not usually a fall person but my maple tree is turning so I decided to include its colors in my card. Congratulations Edith on winning last week. I had fun with the challenge this week. Got a bit sticky, but I felt I was back in 1st grade again playing with my glue! DT you have wowed me again this week with the cards you made. Love the wide variety of fall-like cards. Terrific creations, as always. I decided to try a wee card for the fall challenge. I was so lucky and honoured to win the $25.00 Gift Certificate from Cheryl. I had a lot of fun buying, but it was so hard to choose * grin. These cards are great. I had fun with my entry too. I LOVE Sassy Cheryl's but haven't had the extra to buy some images. They're so stinkin cute though! I pick falling snow, hope that was ok. I couldn't find a fall image that wasn't halloween. Thanks for letting me play.